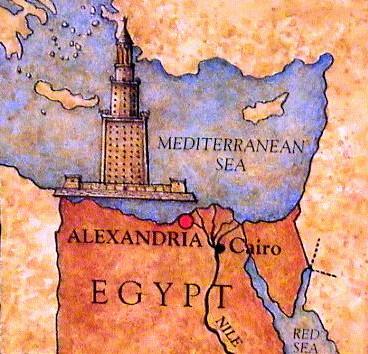 The Lighthouse of Alexandria is one of the classic “Seven Wonders of the Ancient World” , , . It was still a great tourist attraction well into the medieval period, and was visited by many travellers to the city that were impressed by its magnitude. The lighthouse was constructed in the 3rd century BC., ,  “During the reigns of Ptolemy I [Soter 367-283 BCE] and his son Ptolemy II Philadelphus [285 -246 BCE (Ptolemaic)], Alexandria developed into a great city”. The height, form and multifunction of the lighthouse never failed to impress its visitors as it was located on the small Island of Faros, off the city coast. There are very different opinions on the height of the lighthouse (eg. See the figure on the right). Because of different views, its size varies dramatically, to an extent the number roughly changes between 100 and 200 meters high. Size calculations were mostly based on the witness records of travellers from Muslim World. Another example "The Arab descriptions of the lighthouse are remarkably consistent, although it was repaired several times especially after earthquake damage. 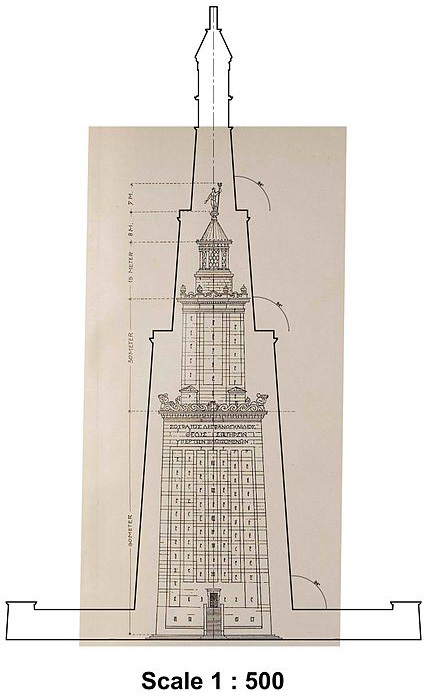 The height they give varies only fifteen per cent from c 103 to 118 m [338 to 387 ft], on a base c. 30 by 30 m [98 by 98 ft] square... the Arab authors indicate a tower with three tapering tiers, which they describe as square, octagonal and circular, with a substantial ramp". Al-Mas'udi (9-10 Century) mentions the founder of the Tulunid dynasty Ahmed Ibn Tulun’s additions to the light-house (9th Century). 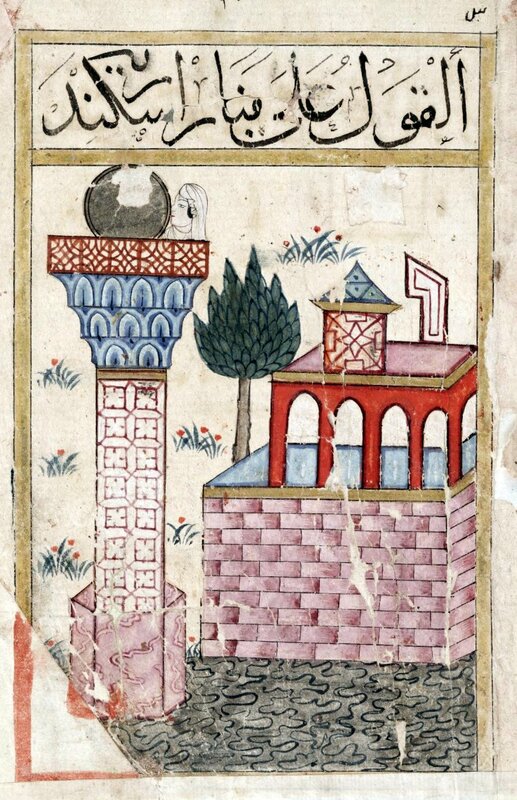 Muhammad ibn Iyas (15th Century) mentions an earthquake damaging the light house. around the reign of caliph Harun al-Rash'd time (9th Century). It has been said that it was seriously impaired by number of natural disasters, eventually collapsed completely and last of it remains castoff in the construction of the Citadel of Qaitbay dated back to late 15th Century, . It lasted for a long time as one of the ancient wonders, alongside with the Mausoleum at Halicarnassus and the present Great Pyramid of Giza. 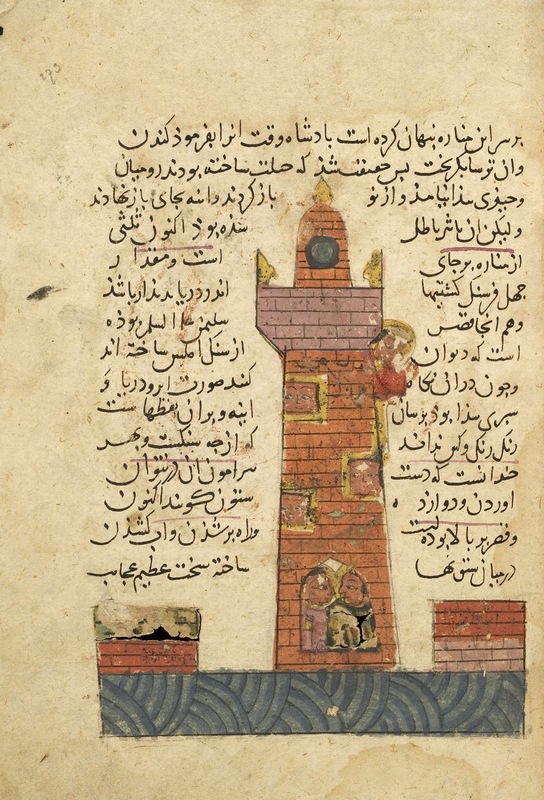 There is also the famous drawing of the ancient Light House of Alexandria by Abu Hamid Al-Gharnati, who left an accurate drawing based on personal observation of the lighthouse. “The first tier is a square built on a platform. The second is octagonal and the third is round. All are built of hewn stone. On the top was a mirror of Chinese iron of seven cubits wide (364 cm) used to watch the movement of ships on the other side of the Mediterranean. If the ships were those of enemies, then watchmen in the Lighthouse waited until they came close to Alexandria, and when the sun started to set, they moved the mirror to face the sun and directed it onto the enemy ships to burn them in the sea. In the lower part of the Lighthouse is a gate about 20 cubits above the ground level; one climbs to it through an archway ramp of hewn stone”. Here Al-Gharnati refers the reader to a sketch he made [Figure above and left] (Al-Gharnati Tuhfat: 99-100; cf Hamarneh 1971: 86, 87. For other detailed medieval Arabic accounts of the Lighthouse with various measurements and other monuments of Alexandria see Toussoun 1936; Hamarneh 1971). 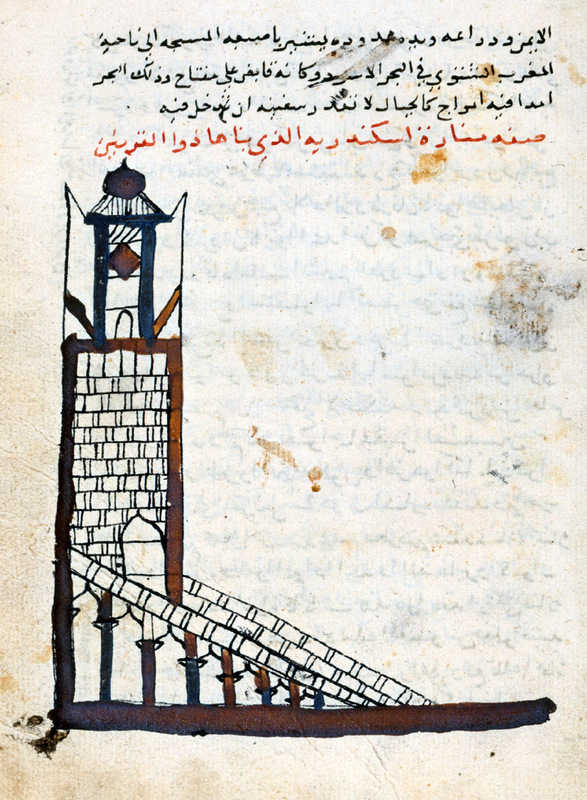 This drawing of Al-Gharnati can be shown to be reliable in the light of recent research (compare this with a modern reconstruction in Empereur 1998: 83). The Lighthouse was particularly admired and was often visited and described by Arab writers, much more so than by their Greek/Roman predecessors, partly because of its mighty size but perhaps also because of their interest in its technology as seen in the function of its mirrors (see Science, page 117 and 118 below). The reference to a mirror of Chinese iron is not a fantasy but reflects the fact that medieval Arab authors were familiar with Chinese sciences and the popularity of Chinese products, in particular the so-called 'kharsini' in Arabic which means 'Chinese iron', or perhaps 'steel' from which mirrors were made (Needham 198th 429-30). As for the military use of these mirrors to burn attacking enemies, stories about this are also known from pre-Islamic literature (Temple 2000: 218ff) and may have played a part in the Arab perceptions of the function of the Lighthouse mirror. Toussoun (1922-23; 1936) used a number of Arabic sources in his study of the branches of the Nile and of the Lighthouse of Alexandria. AI-Mas’udi, Al-Suyuti and Al-Maqrizi are examples of writers presenting comprehensive coverage of Egypt from 'before the Flood' to their own time. The writings show a broad interest in all the buildings and artefacts that they saw around them dating from ancient Egypt. 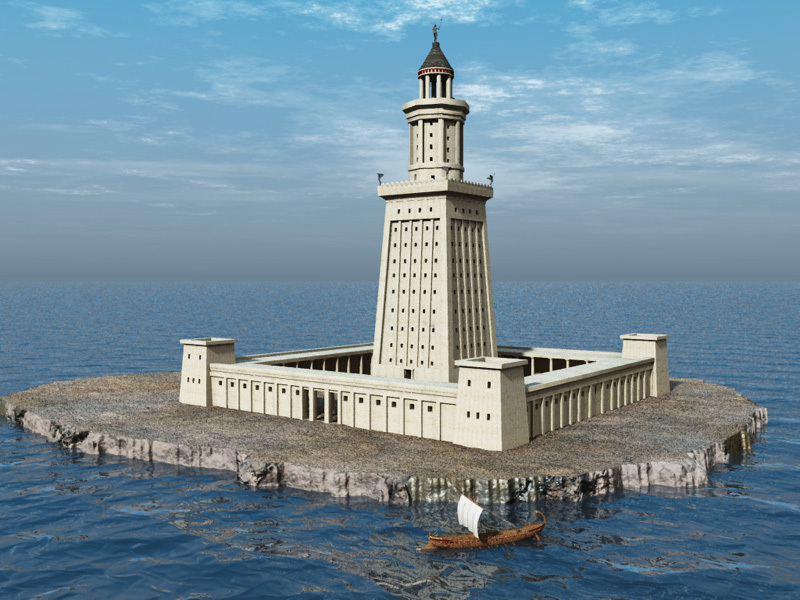 Their descriptions of the Lighthouse of Alexandria, of which few are known to current archaeologists, are in fact closely matched by recent reconstructions. There is a large volume of works on temples, some of which give us a clear contemporary picture of buildings now totally or partially destroyed. Medieval Arab interest in history and archaeology was not limited to Egypt but also covered other ancient cultures, where much evidence can be verified. The Burning Mirror on the top of the Alexandria Lighthouse which, in addition to guiding ships into harbour, had two other functions: the first being an early-warning system enabling watchers to see ships long before arrival at the Egyptian coast; the second being in cases where ships turned out to be hostile - by directing the mirror at a certain angle to reflect and intensify the sun's rays and focusing it on incoming enemy ships, the ships would be set alight at sea (Akhbar Al- Zaman: 154; Al-Harawi Al-Isharat: 48; Yaqut Mu’jam 1: 188; Al-Qalqashandi Subh 3: 356). Ibn Hawqal (Surat: 142) disagreed that those were the functions of the mirror, believing the whole structure to be an observatory to study astronomy (on the Burning Minors see Toomer 1976). A city lighthouse with a dome on top, painted with a special chemical which, when the sun set, illuminated most of the city. Neither wind nor rain affected this light, which faded only when the sun shone (ibid: 145). A lighthouse that flooded the city with a different coloured light each day of the week. The lighthouse was in the middle of a pond with coloured fish. The city was protected by talismans with human bodies and baboon heads. Nearby, a special new city had in its centre a dome, above which a permanent cloud always rained lightly. At this city's gates were statues of priests holding scrolls of scientific works, and whoever wanted to learn a science went to its particular statue, stroked it with his hand and then stroked his own breast, thus transferring knowledge of the science to himself. These two cities were named after Hermes (ibid: 175-76). This is clearly a description of what was left of Ashmunein, the centre of Thoth/Hermes, and an attempt to explain the remaining monuments based on the ancient fame of this centre. In these words we encounter an early possible confusion between two queens: Daluka (also called Zulaikha) and Cleopatra. We do not know the historicity of Queen Daluka, but her name is almost always used synonymously with that of Cleopatra. Both are said to have built the Alexandrian Lighthouse and a massive wall around all of Egypt to protect it against invasion, and Daluka was said to have built a Nilometer at Memphis. 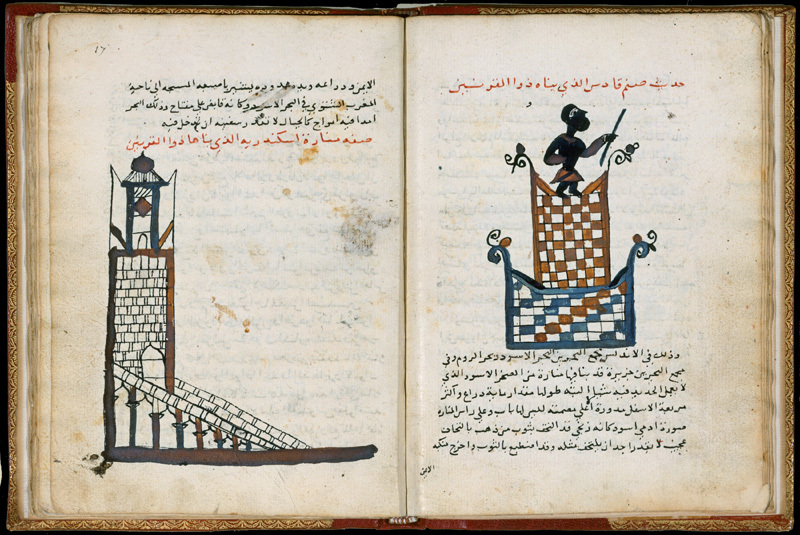 Though Cleopatra did not build the Lighthouse, her fame as a builder of great monuments gave rise to such claims in the medieval Arabic sources. “Progressive Architecture” Volume 44 by Eugene Clute, Russell Fenimore Whitehead, Kenneth Reid and Elizabeth L. Cleaver Reinhold, 1963 , Page 262. “Seven Wonders of the Ancient World” by Michael Woods and Mary B. Woods, Lerner Books [UK], 2009, Page 33. “101 Wonders of the World” by Vikas Khatri, Pustak Mahal, Page xlviii. “Lighthouses big and small” by Eero Sorila, Xlibris (15 Mar. 2012), Page 8. “The Architecture of Alexandria and Egypt: 300 BC - AD 700” by Judith McKenzie, Yale University Press. Page 41. “Encyclopedia of Ancient Greece” by Nigel Wilson, Routledge, 31 Oct 2013, Page 36. Also op. cit. Doris Behrens, Page 1 and op. cit. Judith McKenzie, Page 41.
 op. cit. Doris Behrens, Page 1. “Egypt” by Roberts Russ, Mitchell Lane Publishers, Inc.
 “Handbook of Research on Seismic Assessment and Rehabilitation of Historic Structures” by Asteris, Panagiotis G, Plevris, Vagelis, IGI Global, 13 Jul 2015, Page xxvi. “Alexandria: City of the Western Mind” by Theodore Vrettos, Simon and Schuster, 15 Jun 2010, Page 33.
 op. cit. Judith McKenzie, Page 42. The Cambridge History of Egypt, Volume 1 & Volume 2, by Carl F. Petry, Cambridge University Press, 10 Jul 2008, Page 167. “Seven Wonders of the Ancient World” by Michael Woods and Mary B. Woods, Lerner Books [UK], 2009, Page 32. Also op. cit. Judith McKenzie, Page 41; op. cit. Nigel Wilson, Page 36; op. cit. by Theodore Vrettos, Page 33.